I Matthew "Horseshoe" Hanft blasted out of college on Tuesday, November 22, 2016 excited to hunt that afternoon as well as the remainder of my Thanksgiving break. I got home, threw my hunting clothes on and headed to the woods alongside my father Kraig Hanft. I picked a stand with the wind in my favor looking over a small stretch of a bedding area. It was about 4:15 when some doe's started leaking out of the brush followed by a 3-point. Then that's when I could see the massive 10-point, that had been the talk of the town since the early months of summer, start heading in my direction. As he stopped behind some brush to rack on a small apple tree I clicked the safe off... which was loud enough to draw every doe's attention on me. I sat still as possible waiting for the grand opportunity to harvest this giant. Already shooting a 140 plus inch buck when I was fifteen I thought to my self, "If he takes one more step everyone is going to hate me." Hence the name "horseshoe". Just then he stepped in to the clear and my Marlin 30-06 dropped him in his tracks. The rest was all celebration on a great buck we had trail cam pictures of in 2015 prior to season, and watched in January of 2016 just prior to him losing his sheds. My brother Ryan Hanft collected his left side in February of this year. 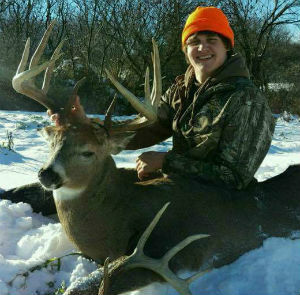 Matthew's buck was taken in Cattaraugus County.